Cha cha cha cha cha, cha! 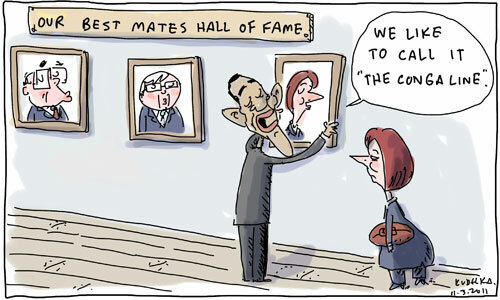 Thank you Mr Kudelka. A picture being worth a thousand words, you’ve just saved me the trouble of articulating my view of Ms Gillard Goes to Washington. Now I can reserve my ranting energy for some other equally worthy source of outrage!! It is inevitable that at some point in the future, an Australian PM will sing “Wind Beneath My Wings” to Congress.